Heading east: 9.000 km by bike – from Germany to Vietnam – ISWI e.V. 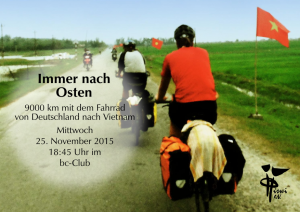 From Freiberg to Ho Chi Minh City. “To experience how Europe transforms into Asia” – that was the aim of Christian, Jule and Marcel. Therefore, they got on their bikes on 31 August 2014 and headed to Vietnam. Around 6 months and 9.000 km later they reached their goal. They will tell you about their preparations and experiences within the scope of a “wanderlust” presentation. The presentation is held in German.